PBS Frontline "Documenting Hate" screen shot of Unite the Right protest in Charlottesville, Va. One post said all were paid actors. 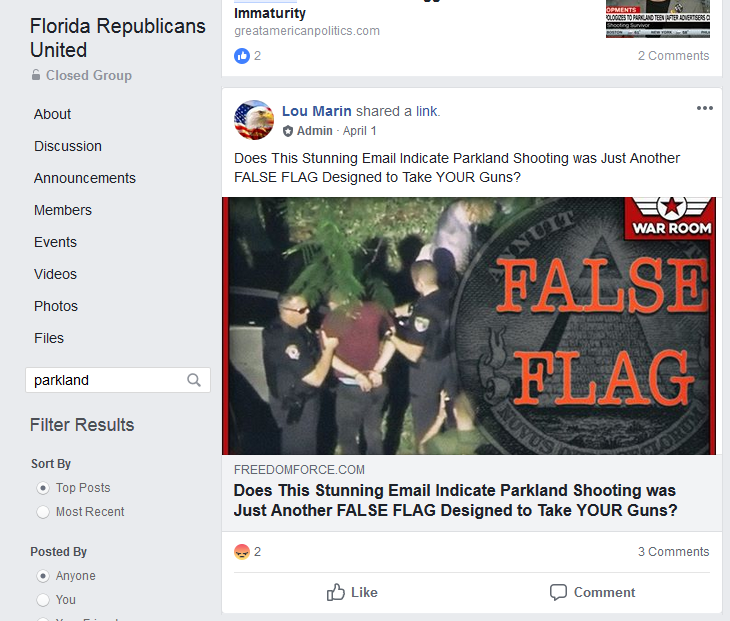 Some officials of the Republican Party’s Central Florida branch have been trafficking in hate speech and conspiracy theories on Facebook – including a horrible claim that the February mass shooting at South Florida’s Marjory Stoneman Douglas High School was a “false flag designed to take your guns,” and an illustrated meme that has one figure shooting another beneath photo of Democratic candidate for governor Andrew Gillum. It’s important to note that these are posts from actual Republican Party officeholders and groups which represent GOP members in Orlando’s Orange County. 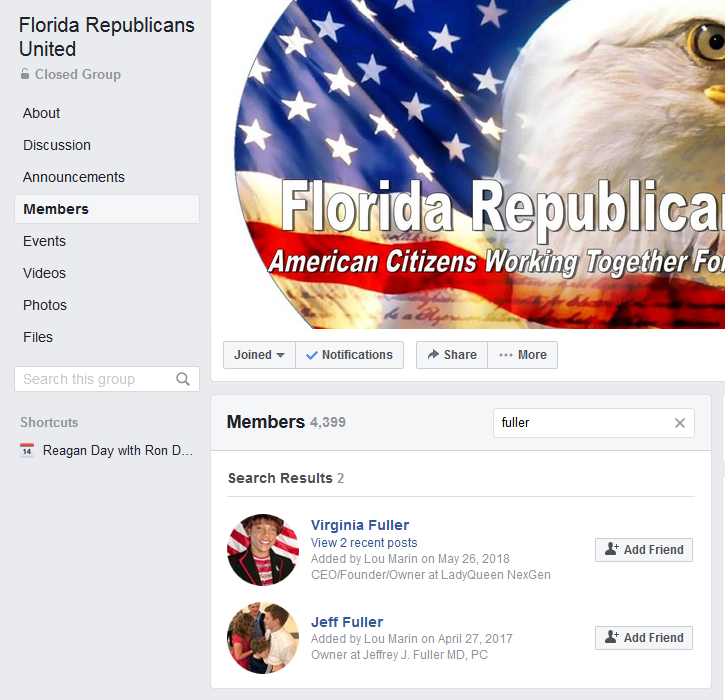 Numerous Republican elected officials – including the Florida attorney general, the running mate of Republican candidate for governor DeSantis, three state lawmakers, and one congressman – have appeared online as members of one private Facebook group called “Florida Republicans United.” Several sought to distance themselves from the group when the Phoenix asked for comment. One post on Florida Republicans United was about the tragic Unite the Right Rally in Charlottesville, Va. where a white-power demonstrator (now charged with multiple hate crimes) drove a car into civil rights protesters, killing 32-year-old Heather Heyer. 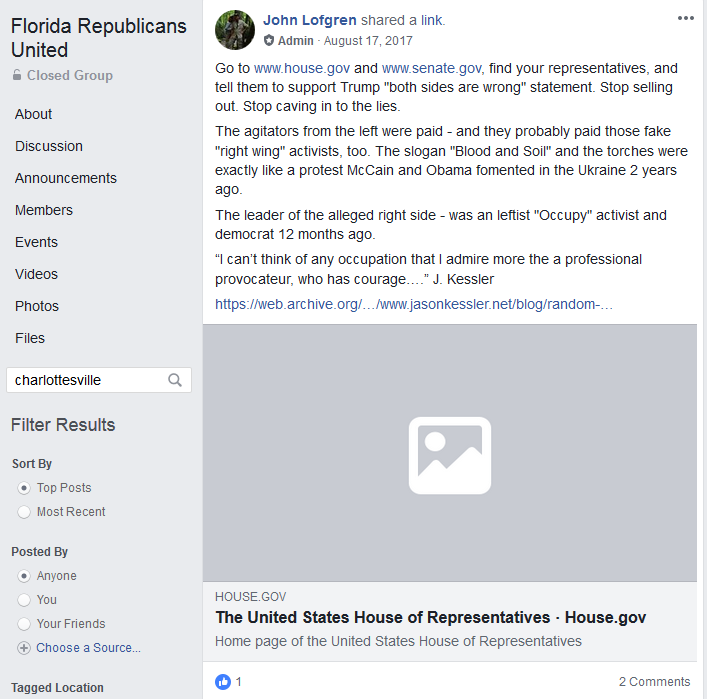 On the post, Central Florida Republican John Lofgren claimed the protest was carried out by paid actors. Lofgren also urged his fellow Florida Republicans United members to contact their Congressional representatives and U.S. Senators to support President Donald Trump’s controversial statement that “there is blame on both sides” – an absurd remark about a domestic terror act in which a man chose to physically run down, kill and injure people who have differing political views. 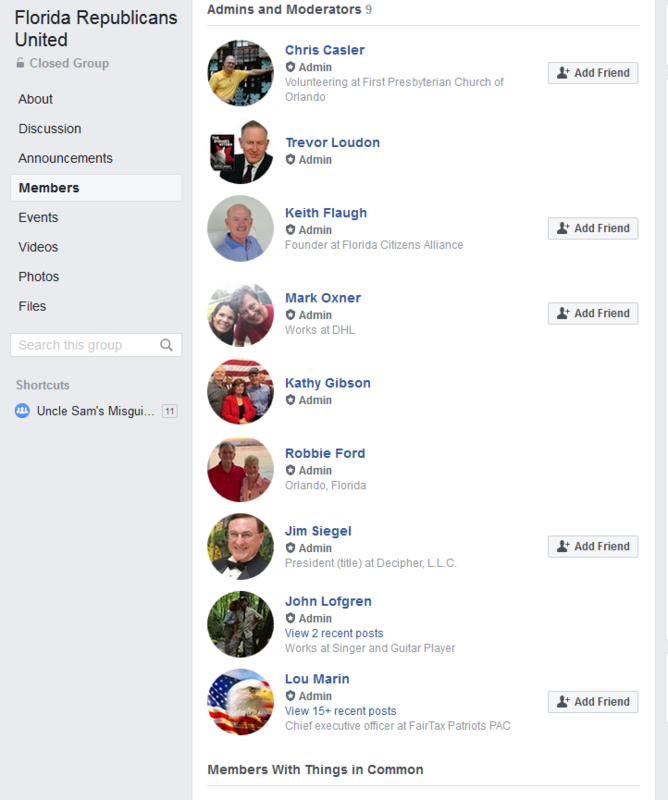 Lofgren is listed as an administrator of the Florida Republicans United Facebook group. Two other administrators are Orange County Republican Party vice chair Lou Marin (who made the offensive Marjory Stoneman Douglas post) and Orange County Republican Party state committeewoman Kathy Gibson, who has been asked to resign over racist posts on her personal Facebook page. She said she was hacked and is not resigning. 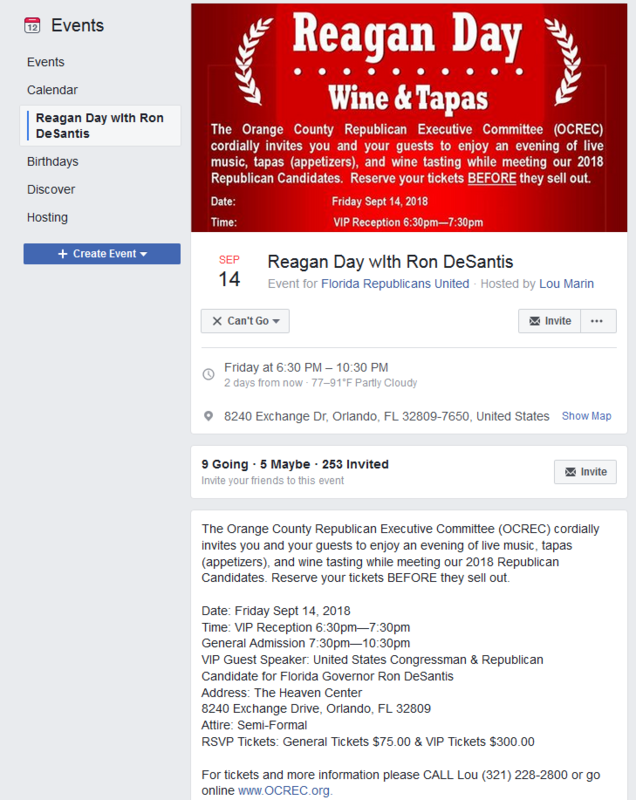 The Florida Republicans United group created a private event Sept. 14 with Republican candidate for governor DeSantis listed as the VIP guest speaker. 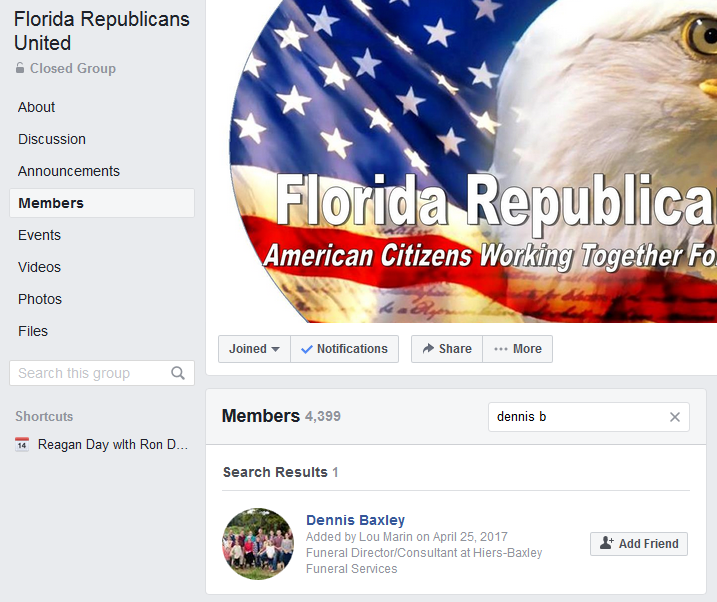 DeSantis is not listed as a member of the group (he deactivated his Facebook account after news surfaced that he was listed as an administrator of the invective-filled Tea Party Facebook group.) DeSantis said he was added to the Tea Party group without his knowledge – something Facebook’s group rules do allow if someone you are already Facebook friends with adds you. DeSantis’s running mate, state Sen. Jeanette Nunez, is among several well-known Florida Republican officeholders on the state and federal levels who have appeared online as a member of the Florida Republicans United Facebook group. She did not respond to a request for comment. Their membership was first reported in an investigation by the progressive fact-checking website Media Matters. State leaders listed as members include Nunez, Florida Attorney General Pam Bondi, Miami-Dade Republican Congressman Carlos Curbelo (running for reelection,) and three state senators running for reelection to the Florida Legislature – Central Florida Sen. Dennis Baxley, Northeast Florida Sen. Aaron Bean, and Sen. Dorothy Hukill, from Northeast-Central Florida. Two Republican candidates running for Congress – Joe Kaufman (challenging sitting U.S. Rep. Debbie Wasserman-Schultz in South Florida) and Virginia Fuller (running against U.S. Rep. Al Lawson in North Florida,) have appeared online as members of the group. The other three Republican officeholders and candidates – Fl. Sen. Baxley, Fl. Sen. Hukill, and Fuller – did not respond to a request for comment from the Phoenix. So who gets on these groups and how? Facebook policy requires that once you are invited to join a group, you are notified and have 28 days to review the group’s posts before you decide to join. However, people can be added by friends who are already in the group. When one Central Florida GOP officeholder was outed for posting a racist meme about Gillum on her personal Facebook page (claiming that Gillum wants “his people” “paid back” for slavery,) candidate DeSantis and Gov. Rick Scott condemned her. Through a spokesman, DeSantis called the posts “disgusting thinking” and demanded that Kathy Gibson resign as the Orange County Republican Party’s state committeewoman. “I am not resigning,” Gibson told the Phoenix in a brief phone conversation last week. Orange County Republican Party vice chair Lou Marin posted a defense of his posts and the Florida Republicans United Facebook group on the official page of the Orange County Republican Executive Committee, saying the posts were to “stimulate discussion and debate.” He accused the Orlando Sentinel of joining “the liberal agenda to quash free speech,” and demanded that the paper tell its reporter to resign. Another one of the Florida Republicans United Facebook administrators is far-right conspiracy theorist Trevor Loudon, who appeared at a private campaign event Sept. 18 where Casey DeSantis (wife of the candidate) also spoke to the Broward Republican Women’s Club. Loudon is an extremist blogger and lecturer who claims that some 120 members of the U.S. Congress are tied the Communist party, to hostile foreign powers and to front groups for the “Muslim Brotherhood.” He tells his audiences that the infiltrators haven’t been caught because Congress doesn’t have a sufficient security checks. Look, we all know that extremists and racists have always been part of America. It is a slow march indeed for those who believe in tolerance, understanding and love – not fear, division and hate. The latter crowd is clearly emboldened by an unlikely president who is their ideological and intellectual peer. It’s not fine. And it needs to stop. I wish I could write this well.